Every evening during the European Meeting brother Alois spoke to the participants. Here is the transcript of his talks. It is a great joy to start tonight our European meeting in this city of Madrid! To get here, some of you have made very long journeys. The city of Madrid, the Christian communities, many religious communities, many families, and even people who live alone are welcoming us. Let’s say, right away, a big thank you to them for this generosity. The hospitality that is offered to us touches our hearts. Every year, for more than forty years now, thanks to the meetings of the pilgrimage of trust on earth, we have experienced that hospitality is a source of joy. "Let us not forget hospitality!" This is the call we want to deepen during these days and throughout the coming year, in Taizé and elsewhere. In the meeting booklet you will find five proposals for 2019, which open avenues for reflection and action. This year we experienced exceptional hospitality. In August, two thousand young people from all over Asia, and other continents, too, came together for a meeting in Hong Kong. Seven hundred young people were able to come from Mainland China. These were signs of hope: signs that the younger generations can prepare for humanity a future marked by cooperation and not by competition. Hospitality brings us close, beyond the differences and even the divisions that exist between Christians, between religions, between believers and non-believers, between peoples, between life options or political opinions. Of course, hospitality does not erase these divisions, but it makes us see them in another light: it makes us capable of listening and dialogue. Hospitality is a fundamental value for every human being. All of us came into life as fragile little babies who needed to be welcomed in order to live, and this fundamental experience marks us to our last breath. The motivation for choosing hospitality lies in the belief that our own life is a gift we have received. And this conviction is nourished by faith. We have just read the first page of the Bible. This great poetic tale, rather mysterious, is intended to help us understand that all that exists is a gift. The sky and the earth, the ocean, the darkness, the light - everything comes from God. And in all that exists, God is present by his breath, his Spirit. Yes, my life is a gift I have received. And other people, too, are, to varying degrees, a gift for me. My own identity is built up through my relationships with others. Of course, the other is always different from me, I do not understand everything about the other and, no doubt, I cannot share everything with the other. Welcoming each other then supposes that we accept limits, mine and those of others. To welcome the other goes hand in hand with discernment. But this can never become a pretext to lock ourselves in by yielding to the fear of the other, the fear that is present in all of us. Those are some thoughts on this beautiful theme of hospitality. Tomorrow morning, you will read in small groups the first two proposals. They are meant to help us to go deeper into faith, into a trust that God always welcomes us first, and that Christ is present in our lives. Let us search, search throughout these days, and we will find. These days, gathered in Madrid, we are together from so many different countries. And those who welcome us are from different generations. With all these people whom we have never met before, we experience communion. And we find in that a joy. Our pilgrimage of trust is also an inner adventure. And tonight I would like to draw your attention to this aspect of our gathering: trust in others, trust in ourselves, and trust in God are intimately linked realities. Trust is neither blind nor naive nor dreamy, it knows how to discern good and evil. But it is the certainty that in any situation, even in darkness, a way leading towards life can open. Trust is not passive, it is a force that in every situation provokes us to take a step forward in order to live more fully and to help others to live more fully. It stimulates the imagination; it gives the courage and the readiness to take risks. But we all know what it means to lack trust. Fatigue, failures, betrayed friendships, violence, natural disasters, illness, all such things erode trust. Trust is something vulnerable. Our trust in God too is fragile. To a certain extent, we all experience doubt: we doubt the love of God, some even doubt God’s existence. Where then are we to find the source of trust? For trust to be born and reborn in us, we need someone who trusts us, someone who welcomes us, who offers us hospitality. We have read tonight an impressive story from the life of Jesus. He comes walking over the lake to be with his disciples in a storm. This story seems improbable to our modern ears. But let us remember the words of Jesus: “Do not be afraid, I am here.” And to Peter, who wants to join him on the water, he says, “Come.” So Pierre jumps into the water. Looking towards Jesus he can move forward, but as soon as he lets himself be hypnotized by the danger, he sinks. Even if we were the greatest sinner in the world, he would speak to us the same words as to his disciples: “Do not be afraid, I am here.” To each and every one of us, he addresses the same call as to Peter: “Come,” leave your little securities behind you, dare to face the sometimes harsh reality of the world. Teresa of Avila, an exceptional woman of the sixteenth century who still stimulates us today, left these words that we sing: “Nada te turbe, nada te espante, quien a Dios tiene nada le falta” (Let nothing trouble you, let nothing frighten you, Who ever loves God lacks nothing). She also said, “Aventuremos la vida!” (Let’s risk life!). Yes, life is beautiful for anyone who sets out boldly and makes courageous decisions. What are these courageous decisions? Each of us is called to respond by undertaking an inner pilgrimage that leads from doubt and fear towards trust. For all of us, it is a question of welcoming the love of Christ and so becoming women and men who build trust and peace, nearby and far away. "Let us not forget hospitality!" This is the call we are deepening during these days. We exchange, we share our ideas, but most of all we experience hospitality. To the families, parishes and religious communities that have opened their doors, to Archbishop Cardinal Osoro and other church representatives, to Ms. Carmena, Mayor of Madrid, and to the civil authorities, to all we express our gratitude for the warm welcome we have found here in Madrid. Cardinal Osoro will now speak to us. We, the brothers of Taizé, are expecting a lot from this European meeting in Madrid. Our ardent desire is that it will awaken hope. Faced with the great difficulties and challenges of our time, some are threatened with discouragement and disillusionment. The sharing and communion that we are experiencing these days can encourage us to look to the future with hope. It is truly a pilgrimage of trust that we are accomplishing. Building relationships, building bridges beyond what divides, that is what our societies need. A society cannot survive without trust between the people who make it up. Trust allows dialogue concerning what divides. Trust can go so far as to respect and even appreciate the peculiarities of the other. We are all part of the same human family. More than ever we need each other. So many questions - the enormous ecological challenges, for example - can only be solved if we work together across borders. Of course, the experience of communion that we are making during these days is short-lived. But it is real. It shows us that trust is possible between the most diverse people. And we see that the Church can be a place that allows this trust to grow. Yes, the Church is called to be a place of friendship, a friendship that grows ever wider. These days we are given an image of the universality of the Church. And this allows us to sense that Christians can promote a globalization with a human face - and that this is even a special responsibility for them. We can begin on a personal scale, exploring how our local communities can become more open, going towards those who are different: the poorest near us - immigrants, Christians of other denominations, believers of other religions, those who cannot believe. Attention to human solidarity is inseparable from an inner life. As believers, let us explore how to renew our prayer, let us practice being attentive to the love of God, in our days and nights. This makes us able to come close to those who are different. Living this openness means first of all listening to others. Do not our dialogues, in society as in the Church, often suffer from a failure to listen? We can begin by trying to understand the other, to understand often complex situations. In October, I was invited to Rome to attend the Catholic Bishops’ Synod on Youth. A wish was repeatedly expressed there: that you, the young, might be able to find people in the Church who listen to you. That your dreams be taken seriously, your creativity supported, your suffering heard. We would like to do everything possible so that solidarity and even friendship can mark the future of our societies. It is in this spirit that we will continue our pilgrimage of trust on earth. The meetings in Taizé will be stages in it, they will take place every week of the year, with a special week dedicated to young adults from 18 to 35 years old, from August 25th to September 1st. It will be preceded, from August 22 to 25, by a weekend of friendship between young Christians and Muslims. 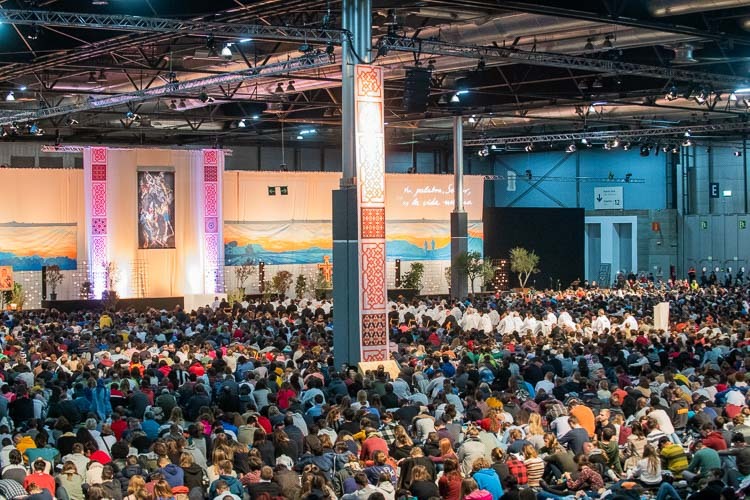 Elsewhere in the world, several meetings will be held along the path of the pilgrimage. A group from Lebanon and other Middle Eastern countries has come and is here among us to invite us to be closer to their reality and to offer us hospitality. From March 22 to 26, we will have a meeting of young people in Beirut. After the summer we will go further south, in Africa. We have so much to learn by listening to what South Africa has gone through in recent decades and where it is today. South Africa is very far from Europe but you are all invited, from 25 to 29 September, for a meeting of young people at the far southern end of Africa, in the city of Cape Town. Then there will be the next European meeting, from December 28, 2019 to January 1, 2020. It will take place in a city where we have already been welcomed. There we have discovered that, though the winter can be very cold, the welcome is very warm. Many of the young people from this country are here with us, as well as two bishops. It will be in Poland, in the city of Wrocław. We are already at the end of our meeting. Tonight we will celebrate the arrival of the new year. And you will have in your welcoming communities a prayer for peace. In too many places around the world, peace is threatened. We must pray for peace and justice, because they do not exist without one other. We should never accept situations of injustice, neither near nor far away. But let us struggle with a reconciled heart. Let us not add hatred to violence. The communion that we have experienced during these days stimulates us and encourages us to make a concrete commitment to peace. Everyone has to to find how to do this. Many of you are already engaged in initiatives of solidarity. I would like to briefly mention three challenges that seem important to me. The first is to reduce the gap between rich and poor. Can we, in small groups in our churches, be more attentive to situations of poverty? Even with limited means, with almost nothing, it is possible to begin, for example by our visits breaking through the isolation of a homeless person, an elderly person who lives alone, abandoned children. A second urgent challenge is undoubtedly the welcoming of migrants and refugees. We can support local and international initiatives to provide them with more security and justice. The security of some cannot be assured to the detriment of that of others. The fear of this phenomenon, of a new magnitude for Europe, is understandable. But one thing is certain: there will be no solutions without personal relationships with those seeking refuge or a better future in other countries. And this third direction: peace between humans requires solidarity with creation. Our wonderful planet is threatened by the reckless exploitation of its resources, the different forms of pollution and the loss of biodiversity. And this leads to injustices and violence between humans. We can all take concrete steps to meet this challenge. These three commitments, among others that are possible, are much more than a moral imperative. By taking them seriously, by dedicating ourselves to them, our own lives can find meaning. One final remark. I have just called for us to struggle with a reconciled heart. This supposes that we go down to the source of reconciliation. This source is not an idea, it is a person, it is Christ. He gives us his peace. Without the inner peace we receive from Christ, the temptation of discouragement and bitterness may become too strong. Close to this source we are face-to-face with Jesus. But we also need people who show us the way to the source. There are women and men in the Church, not only priests and pastors, who are ready to listen to you. They can understand, without judging you, what you are going through, even in the most intimate part of your heart. Look for such a reliable person who can accompany you for a while. For all of us, the pilgrimage of trust will continue right away, already during the journey back home. Here in Madrid, you can continue in the parishes to live the outburst of generosity that you have showed in welcoming us. There is also a prayer with your archbishop, every first Friday of the month, for young people, in the cathedral. We brothers will stop in two places on our way back to Taizé. On January 2nd we will be in Avila to celebrate a midday prayer. And on January 3rd we will be in Barcelona, for a prayer in the church of Santa Maria del Mar, at 8pm. These are, for us, two places that act as a source. Teresa of Avila encourages us in our community life to advance from beginning to beginning. And in Barcelona we have been welcomed so warmly several times. Perhaps some of you can still change your return journey and join us, either in Avila or Barcelona. All of you, have a good journey home! And let us not forget hospitality!